PHOENIX — U.S. Customs and Border Protection officials announced Thursday their biggest fentanyl bust ever, saying they captured nearly 254 pounds of the synthetic drug that is helping fuel a national epidemic of fatal opioid overdoses from a secret compartment inside a load of Mexican produce heading into Arizona. Mexican traffickers have been increasingly smuggling the drug into the U.S., mostly hidden in passenger vehicles and tractor-trailers trying to head through ports of entry. 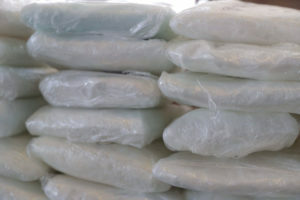 The Drug Enforcement Administration said the previous largest U.S. seizure of fentanyl had been in August 2017 when it captured 145 pounds of the drug in a Queens, New York, apartment that was linked to the Sinaloa Cartel. Before that, the largest recorded fentanyl seizure was 88 pounds nabbed from a pickup truck in Bartow County, Georgia.